Full day tour: Sibling cities Valparaiso + Viña del Mar. 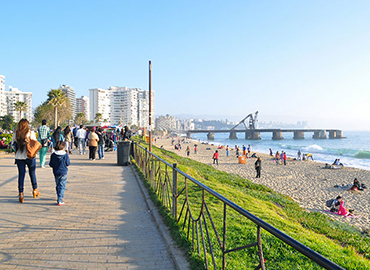 If you want to get to know the contrasts of two cities, as they are typical of the country, we recommend a full-day city tour of the two siblings cities Valparaiso and Viña del Mar. They are located a few kilometers apart and nestle together on the Pacific bay. Her character can be described as the story of a poor brother and a rich sister. In this case we integrate a private transport service to get to know the scattered sights. Practical: 6 hours on the road and discovering the sights of both cities by public transport. Side trip to the Pacific beach included. Catering on demand, on own cash register. Price: 45,000 pesos per person. Service: Private tour, public transport.